Properly de-power your steering rack. 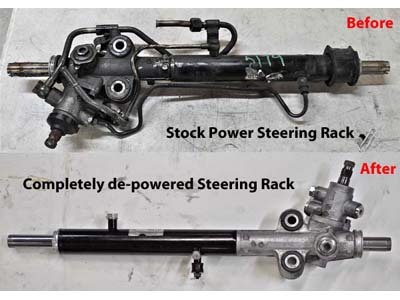 There are a few ways to de-power your Miata power steering rack. Most people just remove most of the fluid and loop the lines together and call it good. The proper way to do this involves removing about 3 lbs of internal components, cleaning the rack and then properly welding one of the internal components to eliminate the torsion bar slop that is left. Mig welding or even basic Tig welding is not the answer here. We use the proper type of welder and appropriate weld material to safely work with the internal components and not make them brittle. 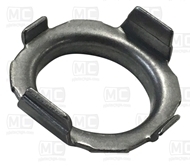 Most guys also don't protect the bearing when welding and end up making the entire situation worse due to the amount of heat the bearing ends up absorbing and then not spinning as freely. Dis assembling the rack is not the easist thing in the world either due to the large aluminum nut that is staked into the steel housing. If you do not know how to deal with the stake, you will strip all of the aluminum thread off of the large nut which will render it useless. Dis-assembly of the entire rack. Ultrasonic cleaning of all the internal rack parts and cleaning of the exterior housing. Removal of all power steering related components in the rack. Welding internal components to eliminate the play. Re-assembly with high performance race lubricants, grease and plugs. 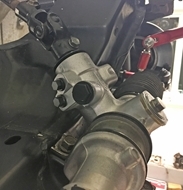 The benfits of de-powering the steering rack is that you end up with a Manual style rack that has more precise feel than the power versions as well as reducing the weight a little and removal of un-necessary lines and hoses. Special assembly lube to reduce friction. Shipping back to you in the continental US. If you would like us to send you new Mazda OEM tie, rods or ball joints please select from the drop down list. These items will NOT come back installed due to what it does to the shipping dimensions and cost. They are very simple to install once you receive them with your steering rack.